I’ve posted a bit about the children’s book about glasses that I’ve been working on – it’s one that I held a Kickstarter project to raise the funding for. Well I’m thrilled to say that the book has been published and is now available for purchase. The whole experience has been fascinating, eye opening, way outside my comfort zone, but in the end, a really good experience. The project was largely inspired by the comments I’d gotten on the photo gallery page. 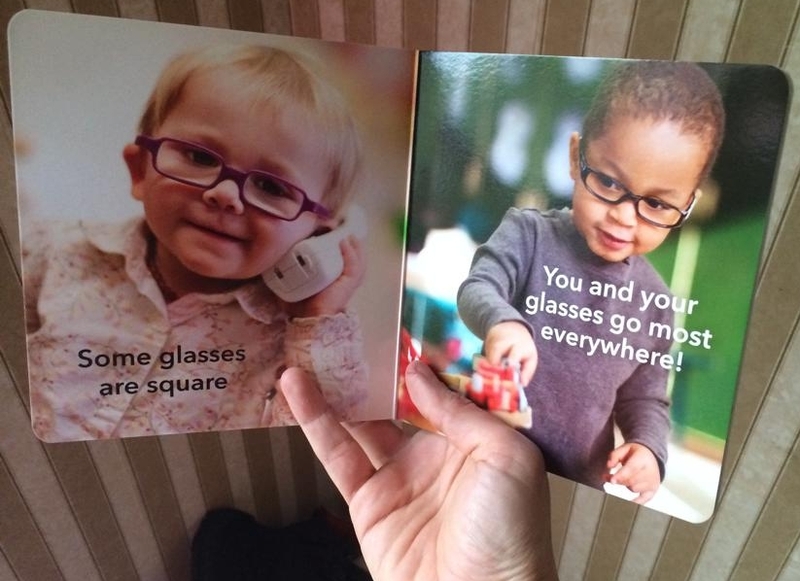 I had figured the photo gallery would be great for parents to see the range of glasses available for kids, but I hadn’t expected that parents would show their kids the gallery, and that kids would feel better about their glasses after seeing other kids like them in glasses. I also remember how much Zoe loved looking at books with pictures of kids, and I wanted her to see kids who wore glasses just like she did. And I was also a bit sick of books that talked about kids who hated glasses or who were teased about their glasses. Those are definitely good stories to have, but they didn’t reflect Zoe’s experiences at all. 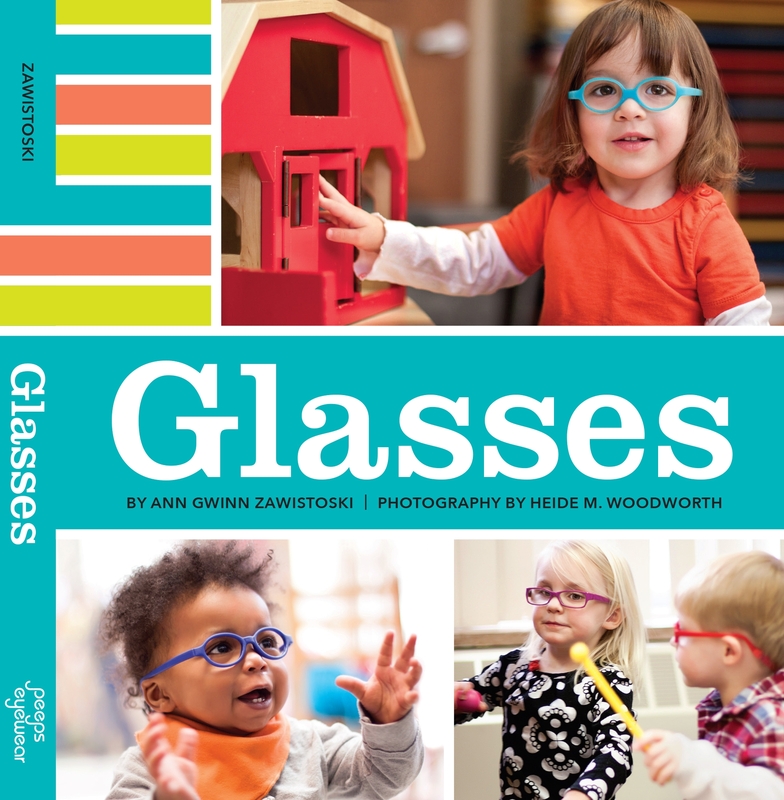 After waiting for 5 years for someone else to write a book that featured photos of kids in glasses, I finally decided that I was going to have to do it. And luckily, I knew that my friend Kristin from Peeps Eyewear was just as interested as I was in helping kids in glasses, and since she had published a children’s book, she knew a lot more about the process and had the contacts to actually make it work. She agreed to be my publisher, for which I am so very thankful. I’m thankful, too, for so many of you who backed the Kickstarter or shared the project or gave me support (I wrote a bit about Kickstarter here and here). I was able to get funding to cover most of the up front costs (photo shoot, graphic design, printing, etc). We held the photo shoot for the book in January. The daycare center that my children attend was gracious enough to let us use their classroom (with fun colorful toys, and huge windows to let in the sunshine) for the photo shoot. Our photographer, Heide, was simply amazing. She worked hard and had a fantastic rapport with the kids. And the kids were all amazing, too! It was honestly a lot of fun – just watching these kids play and have fun, and watching Heide work her magic to get some amazing shots, and meeting the parents and hearing all about their stories. 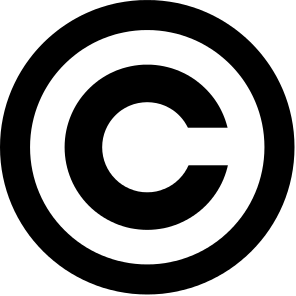 Then came more work – choosing photos, working with the graphic designer, trying to get the print run to be true to color, getting an ISBN for the book… all sorts of things that I had never, ever dealt with before, so again, I’m thankful for Kristin’s help. It took longer than anyone of us had expected, especially since we had to not only produce the book, but also the other rewards for the Kickstarter backers. But now I can hold all that hard work in my hands! that’s my hand…holding my book! I have to say one more huge thank you to all of you out there for your support and inspiration for this book. I don’t know how I can thank you all enough. ← Reader request: anyone with a child diagnosed with CHED? Thank you Sarah! I hope he loves it! Congratulations Ann!! I’ve added a link on our website to the Glasses site. Great job! !